Are you ready to rise in your career? Your nonprofit leadership journey can be rewarding for a lifetime. But you have to plan and get mentors! It doesn’t happen by accident. After rising from Development Assistant to Development Director, I learned a few things along the way. Then I ran a couple of career fairs, and a nonprofit job club in Austin Texas, and then I wrote a 5 star rated book called “Get the Job! Your Fundraising Career Empowerment Guide.” Finally, for the last four years, I’ve run The Fundraising Career Conference and the Nonprofit Leadership Summit. I love helping people find, get and keep their perfect job. Click here or on the pictures below to download a printable pdf of how it works! On top of all of this,for four years I directed the online Fundraising Career Conference. We have had over 1900 attendees at this conference. Speakers have included: Tom Ahern, Linda Lysakowski, Kishshana Palmer, Phil Gerard, Sheena Greer, Claire Axelrad, and many others. As a leader, you need support to be successful. Since the start of the Nonprofit Leadership Summit in 2016, we have helped over 400 people work towards their nonprofit management and leadership goals. PLUS getting your board to raise major gifts, starting your capital campaign, and more! To see what the Nonprofit Leadership Summit is about, click here. 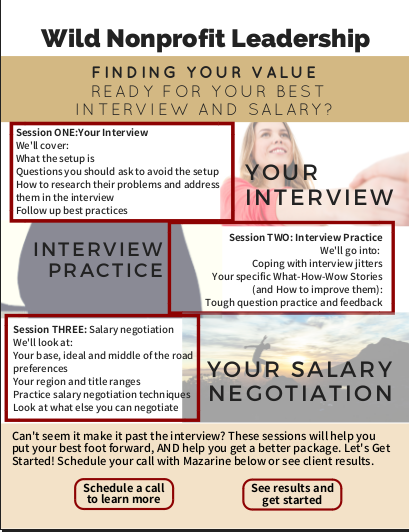 I wanted to share my evaluation of your session on salary negotiation. It was the most important, useful session I attended the whole conference. I’ve never negotiated salary before because I just didn’t know how. You provided clear techniques and research tools, and gave a lot of great advice. I am applying to new jobs now, and I finally have the knowledge and confidence to make sure I’m treated fairly. Thank you so much. Just a follow up: I recently accepted a position at a new employer. I applied a lot of what I learned in your session before and during negotiation. It was so helpful in determining the fairness of their offer and making sure I got what I deserved. I’m really happy with the compensation package I received and I’m so excited for the new opportunity! Thank you and keep up the good work! I’ll be pointing a lot of my colleagues to your resources for sure! Mazarine’s presentation about negotiating your nonprofit salary at the AFP Conference in San Francisco was extraordinary. Mazarine brought contagious energy and encouragement to her session. It was a great mix of presenting and practice! I’ll definitely keep an eye out for her sessions in the future! I’m half way through Get the Job! and I especially appreciate the interview questions to ask them! In the past, granted I’m early in my career, I’ve always assumed that I would take whatever I could get (that’s such a scarcity mindset!). Now, I’m approaching my new job search much more strategically, thanks in part to this book! Thank you!! 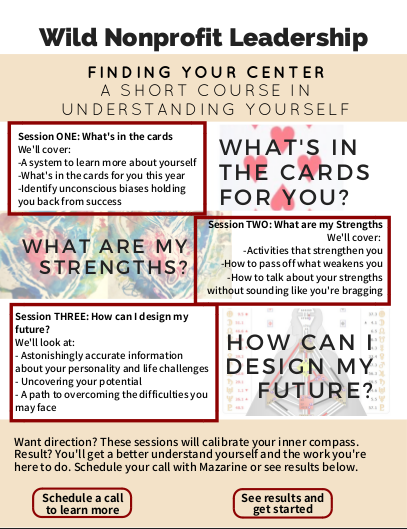 “After attending one of Mazarine’s sessions, you seriously feel invincible! Armed with Mazarine’s insight into development, I honestly started getting worried when three hours after the session had ended and I still had the biggest, stupidest, 1980’s-kid-with-a-new-trapper-keeper-even-though-I-was-born-in-the-’90’s smile that you can possibly image. Not only was the session engaging, informative, and highly applicable, but she did something that I did not see at any other sessions at the conference – in a room of 200, in less than an hour, she made a community. A community where EVERYONE, young and old, felt comfortable to ask questions, make comments, and engage with others in the room. Mazarine was like a group spirit guide; she provided the foundation of knowledge, and then urged us to ask ourselves questions. How can use it? Have we done something like this before? What have others done that has worked? And I think more importantly, is your current job even right for you? “I am prepared for my next two interviews with my negotiating skills that I have learned from the Fundraising Career Conference! I was speaking with a HR person and they asked me my range on a phone interview. I handled it like a champ thanks to your help! 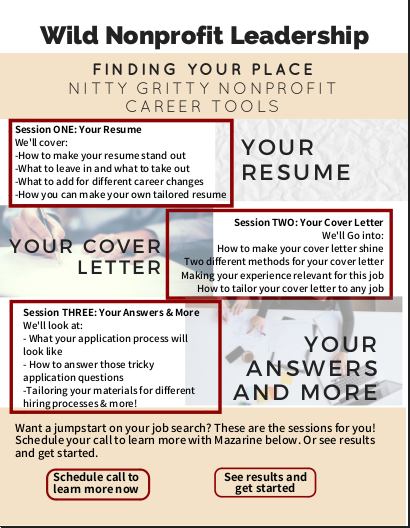 “I normally don’t send emails like this, but I wanted to let you know that the resources you have provided at the Fundraising Career Conference work! I recently on a whim applied for a job at IBM for a business dev position. Wasn’t really serious about it– I love my current job and like the non-profit and higher ed sectors, but thought it would be worth it to at least get some experience tailoring a resume and cover letter for industry. “I cannot tell you how much I am enjoying the conference and I have been raving about it with two of my most valued coworkers. Hopefully they will join in next year. This has really infused me with a spark of enthusiasm for this industry I fell in love with 10 years ago but started to burn out in the past 3 years. While I LOVE the industry, I know it is time to move on to a new project, the question are, what, when, where and how? The conference has definitely helped me with a pathway to figuring out what my next move will be. 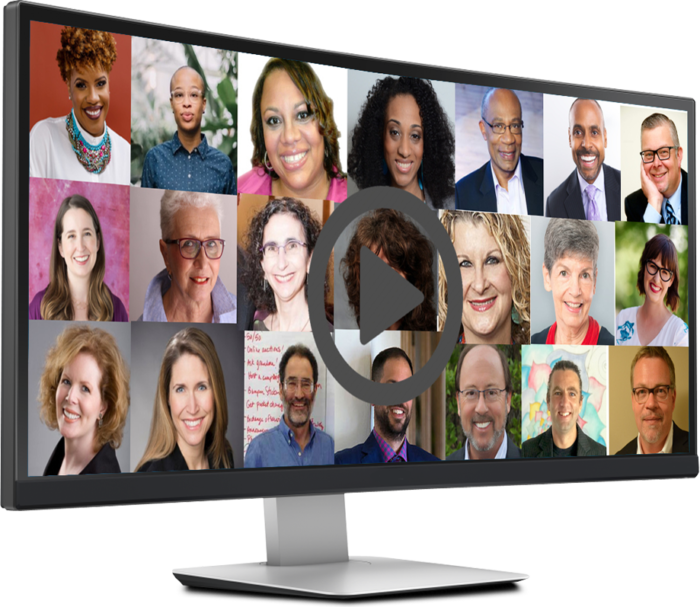 “I can’t tell you how empowering and taking the virtual conference was. Sometimes it was uncomfortable listening–not necessarily a bad thing–to make you realize, “Hello, what were you thinking-taking this job? And why didn’t you realize this sooner? Why are you afraid to move?” ‘Stop feeling like everything is your responsibility,” etc. And–since you are the one doing everything because your gift entry person doesn’t have the capacity to do more–and never volunteers to step up-NO, you will not succeed in doing all you want, nor what is needed to do the best job. It”s physically and mentally impossible. You need to walk away for your own sanity. “I can’t thank you enough for an AMAZING Fundraising Career Conference. The session with you and Tom Ahern was worth the price of admission and then some – though I enjoyed all of the sessions I attended. Yesterday I found out that I will be laid off June 30th. It’s not a surprise. I’ve been planning the transition to consulting for the last five months and already have two clients lined up for small projects in the Summer and Fall. Please know how I appreciate you generously sharing your knowledge, encouragement, etc. This was a treat at just the right time. 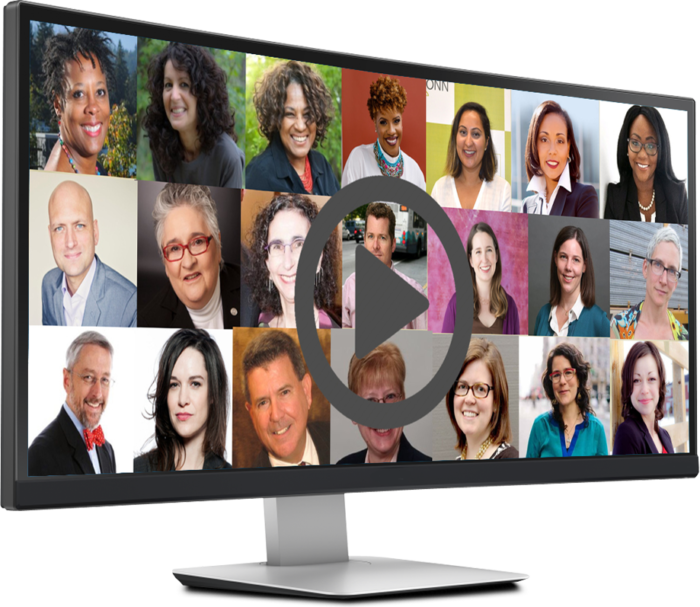 “I enjoyed the virtual fundraising career conference so much. You covered a great deal. All sessions combined, it gave me the confidence to take the next step in my fundraising career. Yahoo! where it’s located. Then, I skillfully dodged the request and wrote that if considered a candidate, I would look forward to learning the salary range they’re prepared to offer before providing my requirements. Thanks to the conference, I won’t settle for less than what I feel is fair, and I have the courage to ask for it.